• An Officer and I hope he/she is never leading my crew. • Thinks about others before themselves. 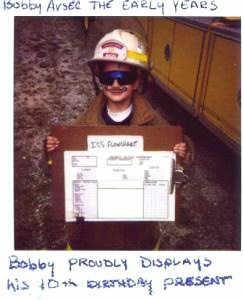 You can't ever start too early to become a good Incident Commander! 2. Have I ever encountered kitchen fire in a single-family dwelling? If yes, we tend to execute similar actions to what “worked” the last time. 3. If No, have I encountered or one that closely resembles it (the kitchen fire)? If yes, we tend to execute similar actions to what “worked” the last time. 4. If No, have we encountered such a situation in training? If yes, we tend to execute similar actions to what “worked” in the training situation. Just like the ABCs of EMS — you can't move to Breathing until you have a secure Airway — we shouldn't move from a higher-priority objective until that primary objective has been accomplished. For example, protect exposures before committing resources to extinguishment. This first radio report, usually transmitted from the front seat by the first-arriving officer, should start to "paint the picture" for other responding resources. Those other fire companies should start to "see" the same building and fire conditions as that first-arriving officer. • Name of the command (Example: Engine 14 has Sand Hills Command). In addition to the basic information, identify for all companies which side of the structure is Side A for command purposes so that everyone is working from the same "map." Many occupancies these days, especially apartment and office complexes, have really unusual layouts; everyone can have a different opinion regarding which side of the building is Side A depending on their direction of arrival. By orienting everyone to the building layout upfront, the incident commander can avoid communication issues later in the incident. Continue to paint the picture for those other responding resources with your continuing communication. Include pertinent descriptive terminology such as "garden apartments" or "townhouse apartments" rather than just "multi-family dwelling." Your size-up report — the second radio report after you've left your unit and completed your size-up of the situation — is where you need to articulate what your initial Incident Action Plan (IAP) is going to be. By your articulating the IAP, the other arriving fire companies have a better idea of what tactical objective they might be given. "Sand Hills Command to all units. Fire also showing from second-floor window on Charley side. All occupants accounted for. Operating in offensive mode, preparing for interior fire attack with 1¾ line, awaiting RIC. Engine 1 take RIC and Truck 14 provide forcible entry for fire attack to Engine 14." • Observe: what is the enemy aircraft doing? 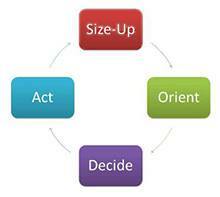 • Orient: what are your surroundings, e.g., the terrain, the weather, the performance of your aircraft, etc.? • Decide: what are your tactical options? Decide on the best option given the present conditions. • Act: Implement the decided upon option. The experience of the Air Force is that pilots who become skilled and practiced at working through the O-O-D-A “Loop” more quickly than the enemy pilot are more successful at winning the engagement. • Size-Up: Nothing new here, right? Building construction, occupancy type, number of floors, etc. • Orient: what’s going on in your “little world”? Example: You and your crew are advancing a hose line to a second-floor bedroom fire in a colonial-style, single-family dwelling; you’ve encountered heavy heat and smoke conditions at the top of the stairs that are keeping you from advancing to second floor. • Decide: what are your tactical options? Continue to advance, possibly into the “teeth” of a flashover? Hold your position on the stairs and call for tactical ventilation of second floor before proceeding? Withdraw completely from the stairwell until the second floor is sufficiently vented? (You’ve got to make one of these decisions, not the Incident Commander. Yes, you have to communicate the action you take to the IC, but only you have all the information necessary to work through the S-O-D-A “Loop” in the limited time available.) Decide on the best option given the present conditions. • Act: Implement the decided-upon option. How Do You Learn to Do This? • Complete National Incident Management System (NIMS) training. As a minimum, a first-line officer should have completed NIMS Levels 100 and 200 from the National Fire Academy (NFA). Even better, get NIMS 300 under your belt as well. All are available on-line in addition to being delivered at locations across the country. • Complete Incident Management training. NFA offers a wide selection of courses—on campus in Emmitsburg, MD, off-campus at locations around the country, and on-line—to provide opportunities to acquire the knowledge and skills to manage incidents of all types, small and large. Contact the agency that’s responsible for firefighter training in your state, e.g., the State Fire Marshal’s Office, the Department of Fire Programs, the Office of Emergency Preparedness, etc., as many of the NFA classes have now been “handed off” to the training organizations for each state for delivery of those programs. • Chief Vincent Dunn (FDNY, Retired). 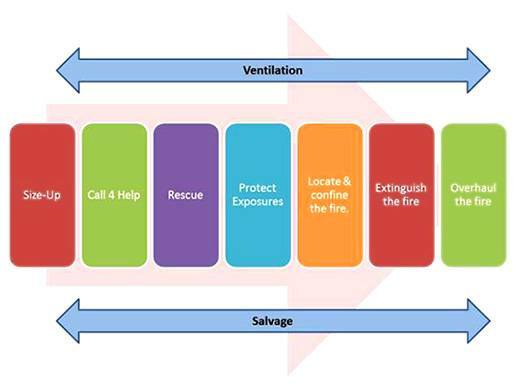 Collapse of Burning Buildings: A Guide to Firefighter Safety. 2nd Edition. • Francis Brannigan. Brannigan's Building Construction for the Fire Service. 4th Edition. There is never a better time than the present to begin developing these skills that are critical to the success of an officer as they lead tactical resources on the emergency scene. Whether you’re already a first-line company officer, or someone who desires to be one someday, what are you waiting for? What do you want people to say when they [Fill in the Blank]?